With the 4th quarter of 2013 under way and talk continuing about recovering prices, Foreclosure Auction sales are a category of national housing sales not typically discussed frequently. 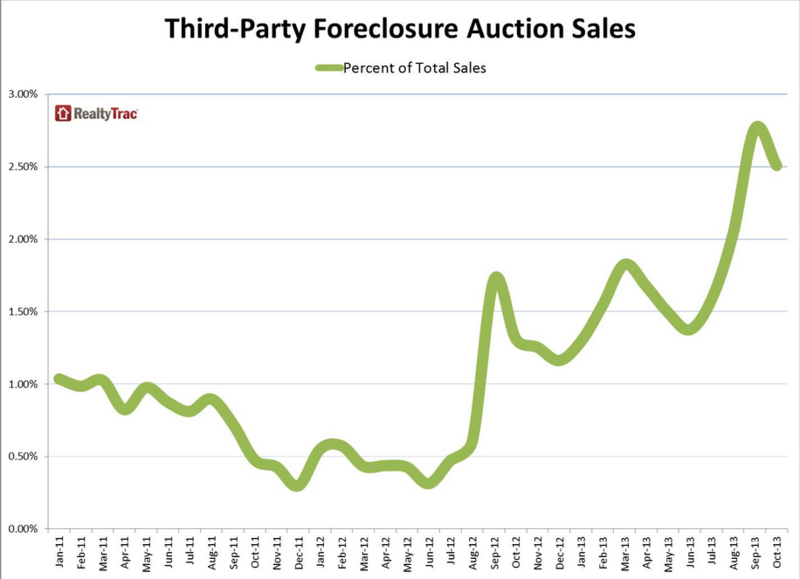 One fact many may not have noted was, October 2013 picked up the pace on foreclosure auction sales. RealtyTrac, a national foreclosure tracking and data firm recently released its October 2013 Residential and Foreclosure Sale Report. This report includes all transactions of condos, townhomes and single family homes nationally, including bank owned property and foreclosure auctions. According to RealtyTrac, the projected yearly pace is 5,649,965 total residential sales. This is 13% higher than 2012’s projection. Although foreclosure sales did take a dip in certain markets, there are other parts of the country that have robust foreclosure activity and are thriving markets for real estate investors. By separating the distressed residential sales from the non-distressed sales, RealtyTrac reports that the median sale price for most non-distressed residential property in October was $185,000 nationally. The median sales price for distressed residential property was $110,000. 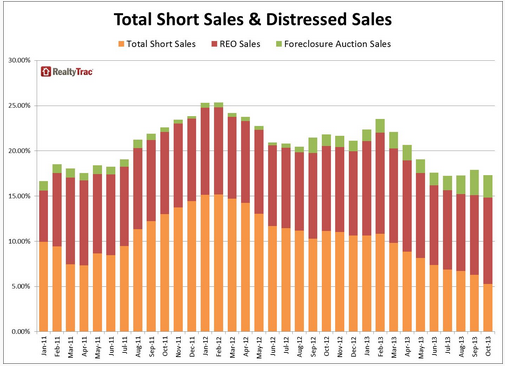 So, why ARE distressed sales surging in the later part of 2013? In October 2012, short sales accounted for 11.2% of total residential sales vs. only 5.3% in October 2013. For the first time, RealtyTrac designated a new category in their report called, “Sales to a third party.” Sales to a third party are also known as auction sales to an investor. These sales accounted for 2.5% of all residential sales in October 2013, which is almost double October 2012. Repossessed properties by lenders, also known as REO sales, in October 2013, were 9.6% of all sales, which was not much higher than the previous October. For Chicagoans, one might ask; “So where does our fair city stand in this nationwide surge of foreclosure auction sales. Auction sales to third parties (investors) year-to-date in Chicagoland total 3,880. 2013 activity already has surpassed all of 2012 when 3,411 properties were sold to third parties, and December is traditionally a strong month for sales to investors. Taking a macro look at the Chicagoland housing market, according to MRED LLC, the local multiple listing service (MLS), there were 99,393 residential sales in the counties of Cook, Lake, Du Page, Will, Kane and McHenry from January 1 to November 28, 2013. Of those MLS sales, 34,443 were distressed sales, or 35%, and this does not include the 3,880 residential properties sold at auction. No matter how you look at it, there are is an abundance of distressed MLS sales and foreclosure sales in Chicagoland, 37,533 to date.